I have chosen this product because of its short time harvesting and also because of great demand in the market .it is a type of product demanded all year round because of daily consumption or exportation purposes and because of this I am aiming at producing enough of this product for my studies and for sell in the market. This particular product garri is gotten from cassava which is planted by propagation method, that is to say ridges and beds are made on the soil before introducing cassava sticks to them. Cassava is planted between April to May and harvested from June to December in the following year. The materials involved are ; a piece of land to cultivate it, labour equipments like hoes,cutlass,shovels etc. The price of cassava that I am going to produce. I am the chief executive officer, I can also be seen as the financial manager and the firm supervisor and I have three people working under me. The objective of the study is to know how profitable the cassava production enterprise is and also to know how possible it can be to produce a large quantity of cassava for the nations utilization. 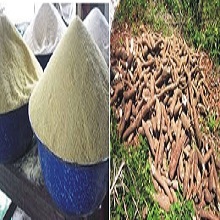 I recommend the production of the cassava because of its ease in production and quantity yields.